Adam Savage has spent his life gathering skills that allow him to take what's in his brain and make it real. He's built everything from ancient Buddhas to futuristic weapons, from spaceships to dancing vegetables, from fine art sculptures to animated chocolate — and just about anything else you can think of. The son of a filmmaker/painter and a psychotherapist, Adam has been making his own toys since he was allowed to hold scissors. Having held positions as a projectionist, animator, graphic designer, carpenter, interior and stage designer, toy designer, welder, and scenic painter, he's worked with every material and in every medium he could fathom — metal, paper, glass, plastic, rubber, foam, plaster, pneumatics, hydraulics, animatronics, neon, glassblowing, mold-making and injection molding to name just a few. In 1993, Adam began concentrating his career on the special-effects industry, honing his skills through more than 100 television commercials and a dozen feature films, including Star Wars Episode I: The Phantom Menace and Episode II: Attack of the Clones, Galaxy Quest, Terminator 3, A.I. and the Matrix sequels. He's also designed props and sets for Coca-Cola, Hershey's, Lexus and a host of New York and San Francisco theatre companies. In 2002, Adam was chosen along with Jamie Hyneman to host MythBusters, which premiered on Discovery Channel in January 2003. Fourteen years, 1025 myths, nearly 3,000 experiments, six Emmy nominations and 53,000 yards of duct tape later, the series continues to inspire. Today Adam stars in and produces digital content for Tested.com. 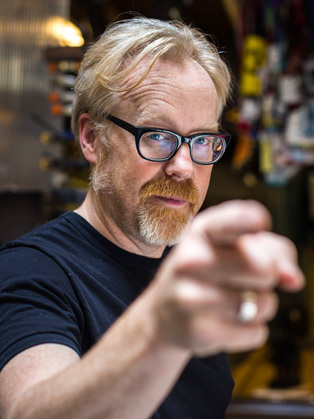 Adam’s many regular Tested series include his One Day Builds (“Customizing Adam’s Hero Sword,” “Traveling Beaver Box”), Inside Adam’s Cave (“Adam’s Terminator T-800 Endoskeleton,” “Blade Runner Blaster Obsession”) and Untitled: The Adam Savage Project, a podcast with Will Smith and Norman Chan. Adam’s occasional series for Tested is called The Talking Room, in which he interviews such special guests as John Landis, Vince Gilligan, Damon Lindelof, artist Tom Sachs and chef David Chang. Adam teaches, lectures and consults on a variety of topics to students, business folks and everyday Joes. His regular public appearances include San Diego Comic Con, Maker Faire and w00tstock (with Wil Wheaton and musicians Paul and Storm); in 2014, Adam also served as keynote speaker for the South by Southwest Interactive Festival. And somehow Adam finds time to devote to his own art — his sculptures have been showcased in over 40 shows in San Francisco, New York and Charleston, West Virginia. Otherwise, in his very limited spare time you’ll find Adam in his man cave, meticulously building anything from a costume to a movie prop to a space-glove vacuum chamber. Adam lives in the San Francisco Bay area with his wife, twin boys and their two dogs.